Editor’s Note: This post is my contribution to Blog Action Day, joining thousands of other bloggers to write about one topic for a single day. This year’s topic is climate change. This is a tough topic for me because I have this feeling in my gut that many people will espouse the opinion that we are suffering from global warming, that it’s catastrophic and that buying the right car or light blub will fix all this. I don’t think it’s catastrophic but I do think it’s an issue. Buying environmentally friendly cars or light bulbs sounds good I guess but I think our world needs to look at its emissions or better yet and more directly pollution which is a past blog action day topic. To me, when you look at a city like Beijing or Rio de Janeiro or Los Angelesâ€¦.actually look at them especially from higher ground looking down on those cities and actually see the pollution in the airâ€¦you know that such pollution has to have a negative effect on their climate and the world’s climate in addition to the obvious hazards to the health of its citizens. Pollution, in my opinion, or more specifically efforts to control pollution will result in greater benefits in the short and long term for our cities, countries and planet. Editor’s Note: This post is my contribution to Blog Action Day, joining thousands of other bloggers to write about one topic for a single day. This year’s topic is poverty. On my recent trip to New York City, among the glamor and the excitement that engulfs the city is a site familiar to anyone who has walked that city’s streets. The homeless. The needy. The poor. Some residents in the area may have become immune to site of beggars on the streets and I can understand why. Walking past them I was torn between whom to give the money toâ€¦there were so many. Would they use my money for food and shelter or to buy booze and drugs to help briefly lessen their pain? I didn’t know. It sadly crystallized for me how monumental a problem poverty is in the United States. â€¢	37.3 million people live below the official federal poverty level, which was $20,614 for a family of four in 2007. This number is up from 36.5 million in 2006.
â€¢	The number of people who are poor by the official government standards is more than to the combined populations of Iowa, Connecticut, Oklahoma, Oregon, Kentucky, Louisiana, South Carolina, Alabama, Colorado, New Hampshire and Idaho. I have worked for many years as a leader in my parish for the Catholic Charities campaign in the Diocese of Buffalo. There are many truly valuable services provided by Catholic Charities in my city and yours. One of those services is help for the poor. Catholic Charities agencies serve one in every 10 people living in poverty. Catholic Charities USA has established a formal program that you can participate in to encourage a focused effort to significantly reduce the problem of poverty for people in the United States. Catholic Charities’ Campaign to Reduce Poverty in America. The campaign provides a multitude of ways for you to get involved in this fight and help reduce this problem. It starts when you register. I hope you will register. I hope you will donate. And like me, I hope you will remember not to forget those less fortunate than us. 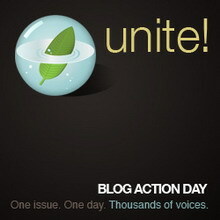 Please consider participating in Blog Action Day 2008 if you haven’t already registered by clicking here. Thanks very much. If you haven’t already registered, please do so by clicking here. It would be well worth your time to post your ideas on the topic of poverty (this year’s theme), no matter the normal focus or theme or your blog. Poverty is not a Republican or Democrat or Green Party issue. It’s a universal, non-denominational and indiscriminate catastrophe that we all need to address in whatever way we can. It could easily be anyone of us at any time. You’ll remember my request for your participation and this blog’s participation in Blog Action Day 2007. Over 20,000 people participated and it moved the message of the environment forward within the social media sphere and within mainstream media as well. Thanks for helping! On October 15, 2008, we’ll talk about poverty and more than 20,000 people (I think) will again move the message to the fore. If you blog, you need to participate by clicking here. If you just read (and that’s cool too) tell your friends about it. If you’re willing to promote it on your web site, grab some graphics here. It started in August and it spread across the internet, gathering steam and support as it went. People talked about it on their blogs which other people read and also signed up. Blog Action Day. One theme: the environment. It wasn’t slanted democratic or republican, conservative or liberal. The topic was the environment and could be written in any way needed to relate to the larger issue in a way suited to the blog and its readership. I noted that I wasn’t the only voice over talent blogging either. Elaine Singer, and Karen Commins had posts that I read as well. Like the other 20,600, each different, each insightful. Let’s hope now that the writing’s done, there is some serious reading as well as thinking done. And action is always appreciated.